Rist guides us through her exhibition at the Hayward Gallery in 2011 and discusses why her works look as they do, and what videos can potentially do to a space: “You can open the walls – you can change the architecture.” Rist wants to free electronics of always being of a certain form – e.g. TVs are rectangular because it’s more practical, but they don’t necessarily have to be so. 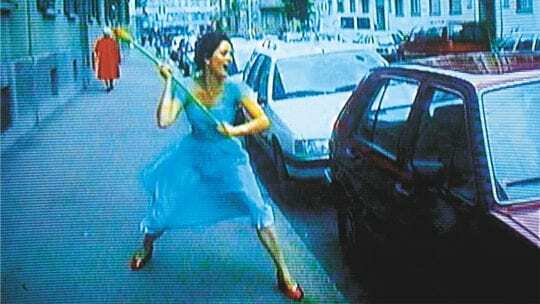 Elisabeth Charlotte “Pipilotti” Rist (b. 1962) is a Swiss visual artist, who works with video, film and moving images, which are often displayed as projections. She takes her name from Pippi Longstockings, heroine of Swedish author Astrid Lindgren’s much-loved series of children’s books. Early on in her career she began making super 8 films, which generally last only a few minutes and contain alterations in their colours, speed and sound. Among the themes her work centres on are gender, sexuality and the human body. In 1996 her work was first featured in the Venice Biennial, where she was awarded the ‘Premio 2000 Prize’. Other awards include the ‘Wolfgang Hahn Prize’ (1999), the ‘Joan Miró Prize’ (2009) and the ‘Cutting the Edge Award’ at the 27th Annual Miami International Film Festival (2010). Rist’s works are a part of prominent museums worldwide such as MoMA in New York City.